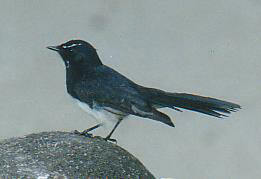 The Willie Wagtail is a small black and white fantail. It is more common on the edge of the rainforest, where there is urban and agricultural landscape. Breeds towards the end of the year. Feeds on insects, mainly flies.